This is a one-week tour crossing over rolling green hills with the white peaks of the Alps as the background, following the varied cradle of the ‘slow food’ movement through the famous vineyards of Gavi, Barolo and Barbaresco. Taste the most famous regional dish: the spicy ‘Bagna Cauda’, many fine chocolates, cheeses and tasty salamis and of course, the king of truffles, the famous white truffle of Alba. 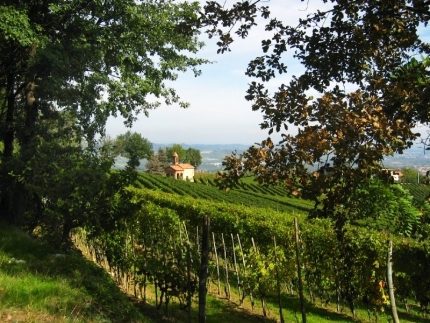 The lands of the Langhe and Monferrato, still to a great extend unknown to many, are unique places. You start in the historic town of Allesandria, cycling through meadows and vineyards, and meandering through valleys topped with solid castles before entering the area of the legendary Fausto Coppi. After crossing the fertile plains, you reach the Monferrato hills, with panoramic views of the Alps. You’ll visit charming historical cities like Casale and Asti, both with labyrinths of cobbled streets and palazzo's built from yellow Tuff stone. You continue on to Benevello passing the ‘hundred towered’ city of Alba, with Roman, Baroque and Gothic Architecture. From Benevello you make a circular tour meandering over watersheds with astonishing views, through hazelnut woods and past several chapels. Through the Bormida, valley you cycle back to Acqui Terme finishing up this magnificent journey.